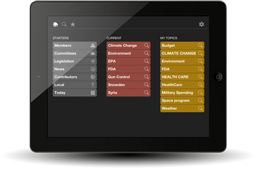 Congressional Members, can be found quickly, with basic statistics on an overview page for each member. All Committees in the House and Senate including Joint Congressional committees may be researched. 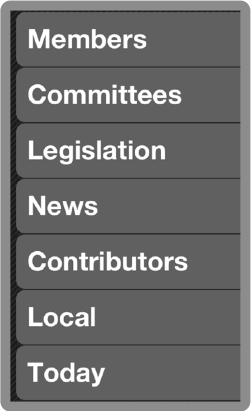 Legislation, in progress in the House and Senate are listed along with basic overview including their authors and backers. News articles on current business of Congress and it’s members is referenced here. This link reveals the contributors to Congressional members. Here you can see graphs of institutions which support election campaigns. By entering your zip code, OurGov can provide news specific to your congressional district and state. This link reveals the current business and news regarding congress, votes, legislation and proceedings. The data that OurGov is built on is easily searchable. Simply click on the magnifying glass in the header of the app and enter a search in the search field of the search popup. You can narrow your search to a single category, or leave them all selected to get results from all the data available in the app.